Coin collections started in China during the sixth century AD, nearly one millennium before the first numismatic manuscript in the Western world was published. The curiosity for coins continued growing during the following centuries, even under foreign imperial rules. In the middle of the eighteenth century, the Emperor Qianlong possessed the most comprehensive collection including an example of all the coins cast in East Asia since the seventh century BC. Coins were also carefully collected and studied by scholars, who between them developed a ‘numismatic friendship’. The period from the late eighteenth to the mid-nineteenth century constitutes a golden age for Chinese numismatics. Following the publication in 1751 of the Qinding qianlu (The Imperially Ordered Catalogue of Coins), many collectors became interested in coins and engaged themselves in publishing catalogues, monographs, or other studies. These publications using the methods employed in literature by ‘Evidential studies’ (kaozhengxue), were highly influential in changing numismatics scholarship. This book guides us into the world of collections and collectors in China by following a group of scholars, who had a passion for epigraphy and numismatics during the first half of the nineteenth century. Some of them are famous scholars and collectors, such as Chen Jieqi or Wu Dacheng. Others are collectors, who are less well known but made crucial contribution to the study of Chinese material culture. Last, this book explores the community of antiques dealers, rubbing makers and even forgers, showing the complex social network that linked all these people together. 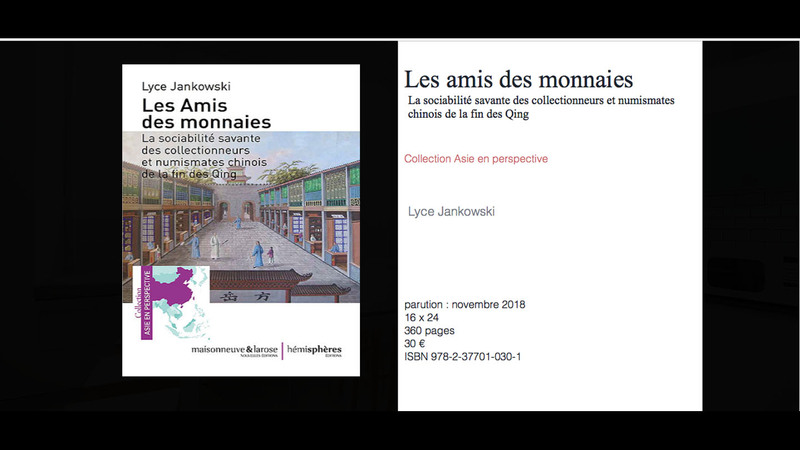 Lyce Jankowski is an art historian specializing in the numismatics of East Asia. She has taught the history of Chinese art at the Sorbonne University (Paris IV) and numismatics at the University of Oxford. Trained in Classics and History of Art at the Sorbonne University, in Sciences of Antiquity at the Ecole Normale Supérieure and in Chinese at the National Institute of Oriental Languages and Civilizations, her main research interest is the history of Chinese art collections.